Whenever I go out to a restaurant and order steak, I always, always order a side of Béarnaise sauce. I love the way the rich sauce and the aniseedy tarragon mingles with the savoury, charred outside of the steak and the juicy red meat within. But I most often cook steaks at home, and I don't usually whip up a batch of Béarnaise just for myself. But by placing a couple of slices of this flavoured butter on top, I get that buttery, tarragon kick in seconds. I hope you enjoy. Lay out a square of cling film, about the size of an A4 piece of paper. On it, dab on the butter and sprinkle over the salt and the chopped tarragon. Using the cling film, press and knead the herbs into the butter until they are pretty much combined evenly through the butter. Push the butter into a small log-shape and wrap in the cling film. You can chill this for an hours or so until firm before using, or pop it in the freezer (as I do) and slice chunks off just before you put your steaks in the pan. 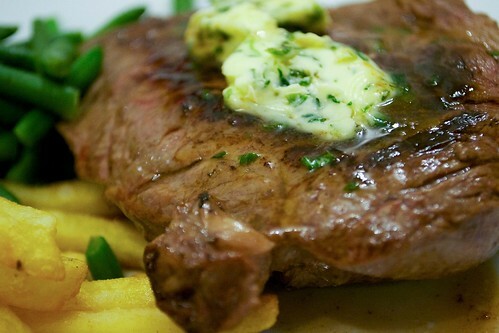 To cook the steak, rub the steak with a little olive oil and heat up a dry, non-stick frying pan. Lay the steak into the hot, dry pan and cook for 5-6 minutes on each side. This will give you medium-rare steak. Rest the meat in a warm place for at least 5-10 minutes and then arrange the slices of herbed butter over the top.